Our henna is HANDMADE personally with Organic Rajesthani Henna Powder, Organic Lavender Essential Oil, White Refined Sugar & Water. If you are ever concerned, we can setup a patch test a minimum of 24hrs prior to your service at a convenient location for both parties. For individuals with sensitivities, the paste can be made essential oil free (or with a substitute oil) but the stain quality can't be guaranteed. For vegan clients, paste can be made with unrefined sugar. Free consultations are available & highly recommended for all Bridal Henna (Mehndi) & Makeup, Tattoo Trials, and other detailed work. There is a wide variety of body art designs & options to choose from; please view our Gallery or Instagram Page for inspiration. Each design will always be one-of-a-kind even if it is being replicated. Prices vary based on type of event, location, intricacy & coverage. Henna/Mehndi Art is available in Natural Henna, White "Henna" (body safe paint) & Glitter "Henna" (using body safe glitter & glue). Specialty decor/setup options available upon request. PUBLIC appointments @ Festivals/Markets/Events: Mostly simple designs are available; average prices are $5-30 per piece; first come, first serve (pre-booking is available at some events). Please visit Services or our Facebook Page for an event list. PRIVATE Appointments @ Pure Serenity Spa: Choose your design(s) or let me freestyle! PRIVATE Mobile Appointments: $90 for the hour for 1-2 people. For appointments longer then 1hr, please refer to the group/bridal rates below for the best price. Includes travel to Delta, Surrey (up to 152nd St), Richmond, New Westminster & Burnaby. There may be a slight up charge for travel to other cities. MATERNITY Blessings/Appointments: Recommended in your 3rd trimester; paste is also available Essential Oil Free if recommended by a Doctor and/or if you have any sensitivities. Includes travel to Delta, Surrey (up to 152nd St), Richmond, New Westminster & Burnaby. There may be a slight up charge for travel to other cities. If you'd like to have a Blessings Ceremony, please refer to the group/bridal rates below for the best price. Group Appointments/Events/Parties (only available at your venue): Booked by the hour per artist with a 2hr minimum; additional artist rates will vary. In 1 hour, we can create 2-12 designs depending on intricacy & coverage. Great option for wedding events, ceremonies, birthday parties, girls nights, etc. See rates below! Bridal Appointments: Booked by the hour with a 2hr minimum; average appointments take 4-6hrs. A consultation & non-refundable deposit is available & required! Upon consultation, we assess the brides needs to determine the time required & a sketch design based on the clients requests. You'll also receive a free piece to test stain quality once the deposit is paid. See rates below! Travel to other locations, as well as out of town, is available; prices will vary so please inquire! ​All bookings get a thank you gift which may include Aftercare Balm, product samples, temporary tattoos, plus more! All clients receive Aftercare Instructions in order to achieve the BEST stain! Follow closely to achieve a deep, dark stain & increase longevity. The stain will take approximately 48hrs to fully develop & is the most vulnerable during this period. The paste also will take 15-30mins to fully dry & needs to stay on your skin for at least of 1-4hrs. However, 6-10hrs is preferred. Please book your appointment accordingly. Wax* your arms/legs 24hrs prior to getting your Henna done for a smoother application that will also last longer! Half Arms - $20.00 / Full Arms (includes underarms) - $40.00 / Half Legs - $30.00 / Full Legs (includes Bikini) - $50.00. Combine waxing services for additional discounts! Add a 15min Face and/or Scalp massage for $10! Perfect for while you're waiting for your henna to dry. 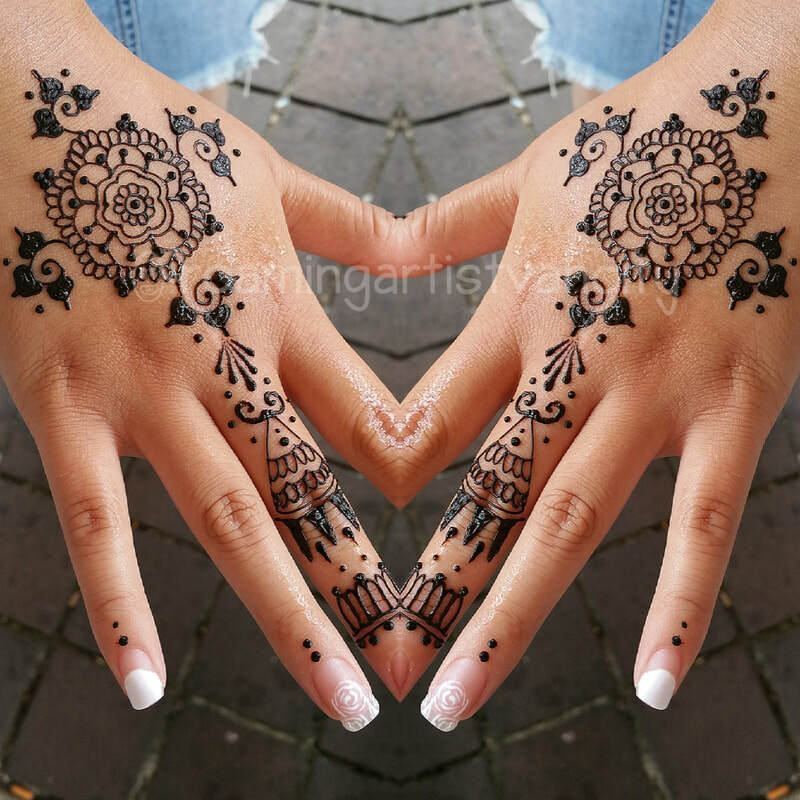 Want to purchase your own Henna &/or Supplies to create your own designs? Visit our Retail page now!